August is National Breastfeeding Awareness Month and I am so happy to share my breastfeeding stories and support other moms! I will be the first to admit that breastfeeding is extremely hard and time consuming BUT SO WORTH IT!!! For me, my breastfeeding journey started with my first child and started and ended as a struggle. I just didn't produce enough milk to keep him gaining weight and he refused to nurse anymore at 7 months. With my second child, I also struggled producing enough and worked hard to pump and feed, pump and feed. It was so hard but I knew how important it was for my baby to have breast milk. My hard work paid off and I nursed until almost 2 years old. 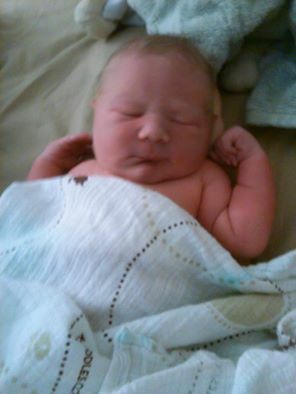 And then with my third child, I prayed and hoped I would be able to produce enough right off the bat. I sought out a lactation consultant, took medication and pumped from the start. Sadly, I still struggled with producing enough and pumping once again became my constant companion. Luckily, I learned about the Pump and Go from tommee tippee to help me get through the tough months! The Pump and Go set allows for easy pumping with your favorite breast pump into bags that can be used for pumping, freezing and then also used to feed! 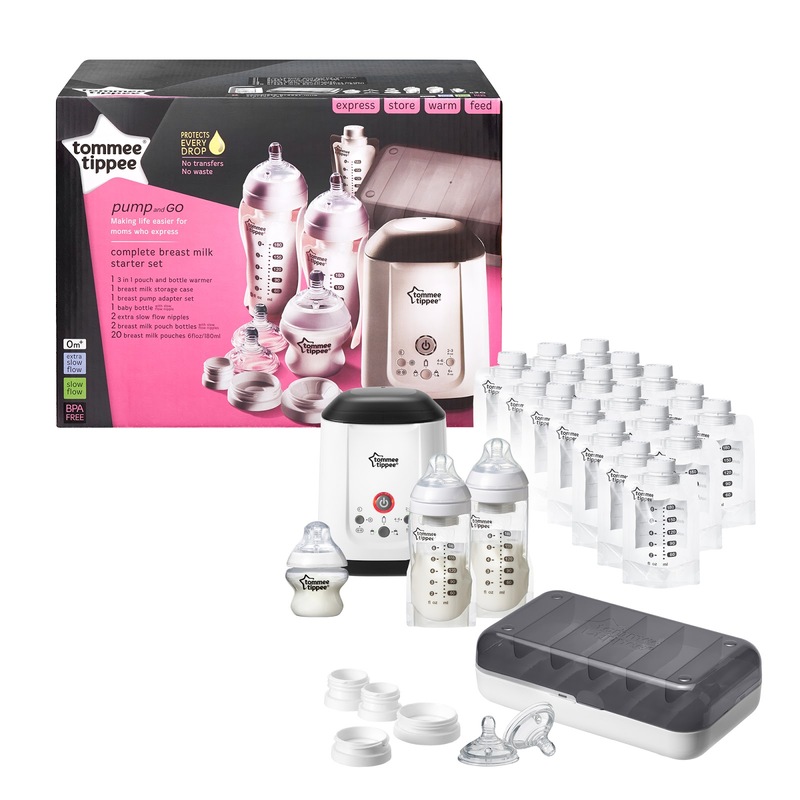 It made the whole routine of pumping, feeding, and storing so much easier on me and with this set, I never lost a drop of that hard-worked for breast milk. To me, every drop was precious and I was so happy to not have to transfer around the breast milk fifty times every time I pumped, stored and fed! By using a single pouch to pump, store, warm and feed, there's no need to transfer milk at any stage, so you'll never lose a precious drop. If you're a busy breastfeeding mom who wants to pump, this All in One Starter Set contains a complete solution to help keep things simple. The set contains all moms need to turn their favorite pump into part of the Pump and Go System ensuring you protect every drop of breast milk. It includes bottles, the Pouch Bottle, storage container for the pouches for the freezer, pouches with spot for the name, date and extra info, and a great Bottle Warmer! With this set, you are ready to pump at work, at home, anywhere! I definitely recommend the The Pump and Go for all busy breastfeeding moms - it takes away the extra stress of wasting any milk! By using a single pouch to pump, store, warm and feed, there’s no need to move milk at any stage, so you’ll never lose a precious drop! It makes a great gift any new mom and make being a new parent just a little easier! 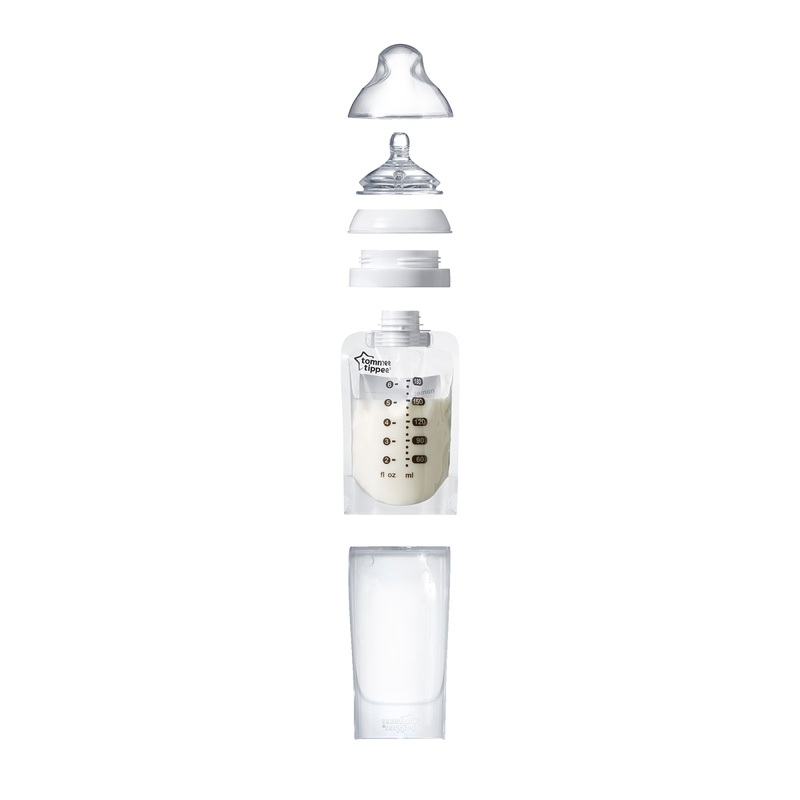 If you struggled breastfeeding like I did, pump at work or just want an easier system for pumping and storing, then I totally recommend the Pump and Go system from tommee tippee! And know that so many others are out there struggling, working to survive another day with a newborn and we support YOU on your journey!! To all breastfeeding moms out there, Happy National Breastfeeding Awareness Month! YOU ARE AWESOME! 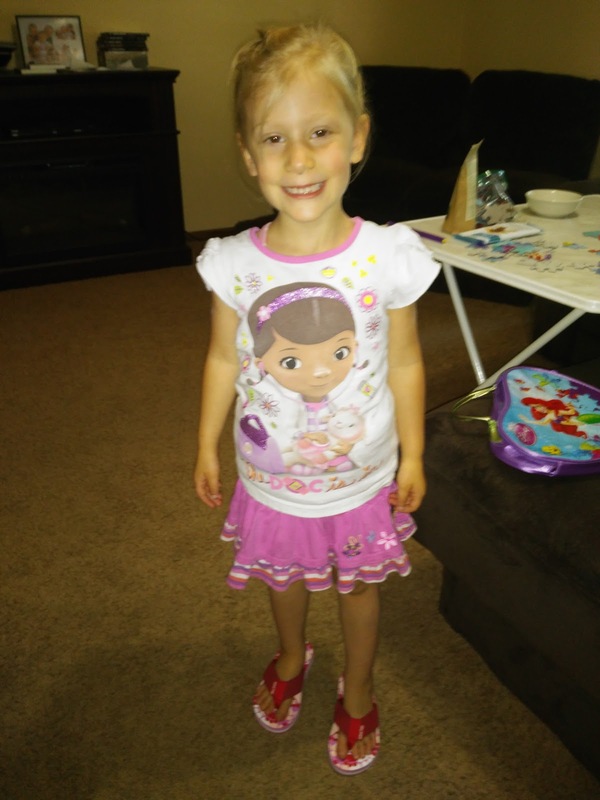 School will be starting again before we know it but for these last couple of weeks of summer you must let your children walk around in their super cute unique, colorful and playful flip flops for kids called Animal Traks. Whether you are headed to the beach, on a walk or even in wet pavement, these sandals leave adorable prints wherever your children go! My children received the adorable Bear and Dino Flip Flops and they couldn't be happier! 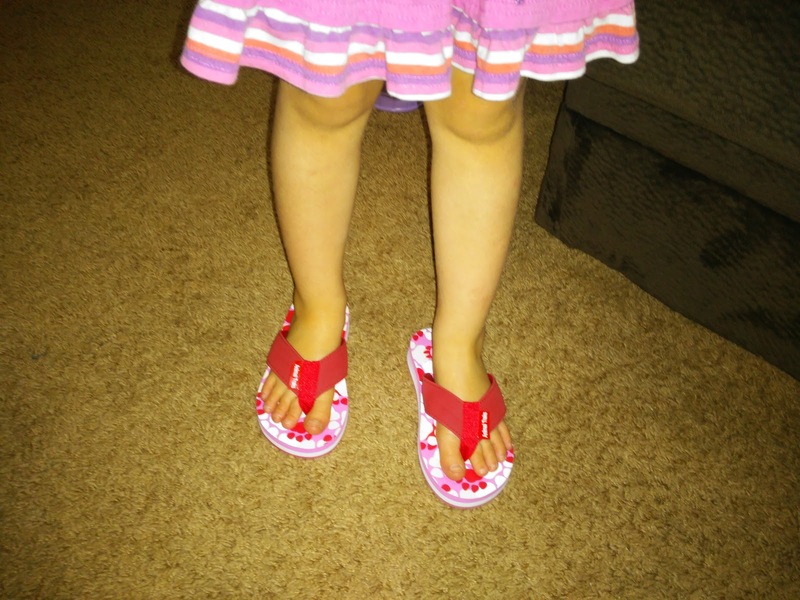 They love the fun animal prints they can make and the flips flops are comfortable and so cute! 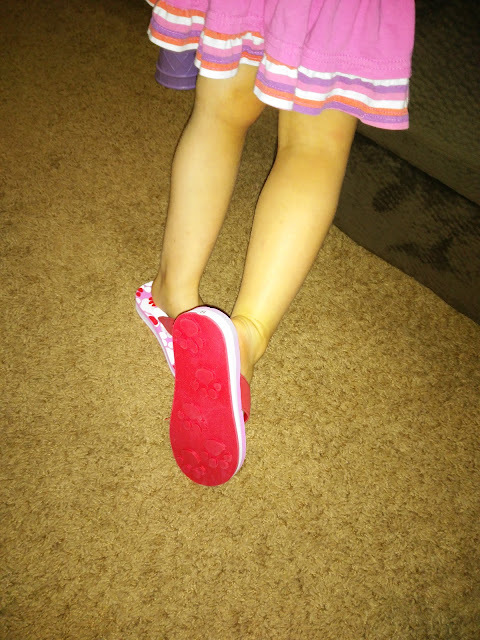 My daughter received the Bear flip flops in red and they were a little big but that wasn't stopping her from smiling ear to ear every time she wore them! There were her first "big kid" flip flops without straps on the back and I love the comfortable extra thick heel with small arch support so they protect her feet from foot problems! 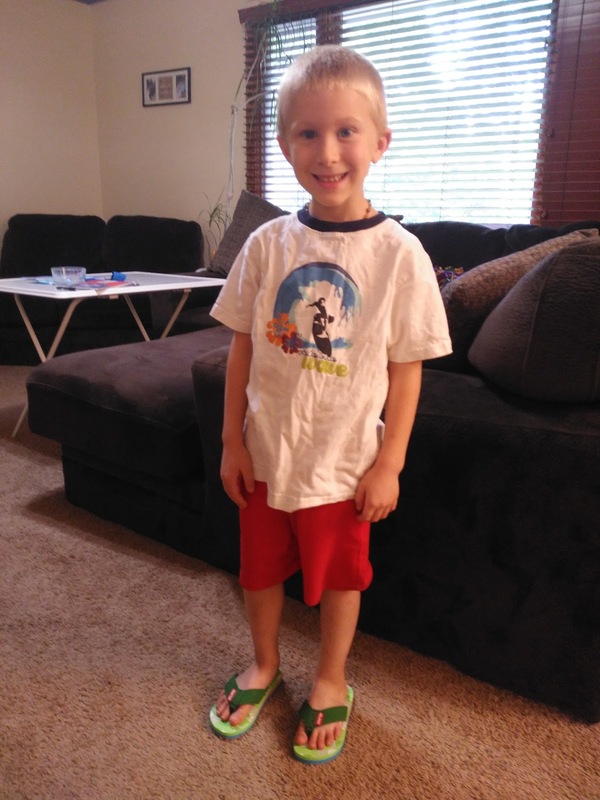 And my son is a HUGE fan of Dinosaurs so the Dino flip flops were a must-have for my son! 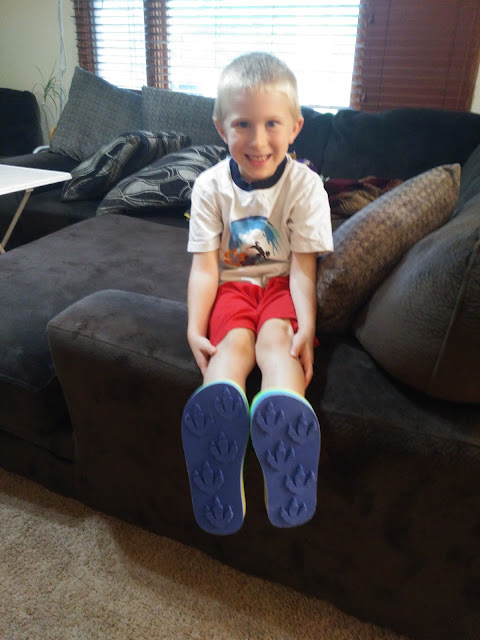 He was instantly thrilled and wouldn't take them off! I love that they are quick dry and easy washing and are made with thick quality material! I don't have to worry about my son wearing a hole through these flip flops! If you want a fun summer gift for your children, Animal Traks flip flops are super fun and comfortable for making trips all over the beach! Did you miss the Independence Day festivities and firecrackers this year like I did? I love firecracker shows but with three small children I just didn't get a chance to go to one this year. But don't worry - I am finding fireworks in my mouth every day of the year if I want and so can YOU! Chuao Chocolatier offers to take the fireworks from the sky and into your mouth with their Firecracker chocolate bar! My husband is a HUGE fan of this Firecracker bar which features silky dark chocolate with a dash of chipotle and a sprinkling of sea salt until… SURPRISE! Popping candy explodes and starts a party in your mouth. My children also love to hear this popping as we eat the bar! This Firecracker bar is only one delicious chocolate bar as part of the Deluxe chocolate bar gift set that I received from Chuao Chocolatier! 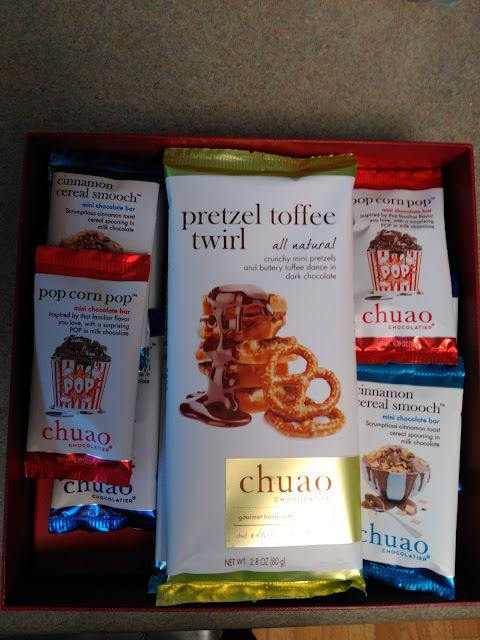 I really got to experience the WOW of Chuao with this yummy assortment of full size and mini chocolate bars. The Gift Set Includes: 2 each of the following mini chocolate bar flavors: Firecracker, Cinnamon Cereal Smooch, Pop Corn Pop, Honeycomb, Salted Chocolate Crunch, Sweet & Salty. 1 each of the following chocolate bar flavors: Oh My S'Mores, Pretzel Toffee Twirl and Ooh Ahh Almond. All these bars are handcrafted with ethically sourced cacao, gluten free ingredients and free of artificial preservatives, sweeteners, colors, flavors and hydrogenated fats. My favorite is the Pretzel Toffee Twirl and the Ooh Ahh Almond is amazing too! It is so hard to even choose favorites - I wasn't disappointed with any! I also got to try the Caramel Apple Crush and that was also so delicious and tangy! I just how unique the flavors are from Chuao Chocolatier! 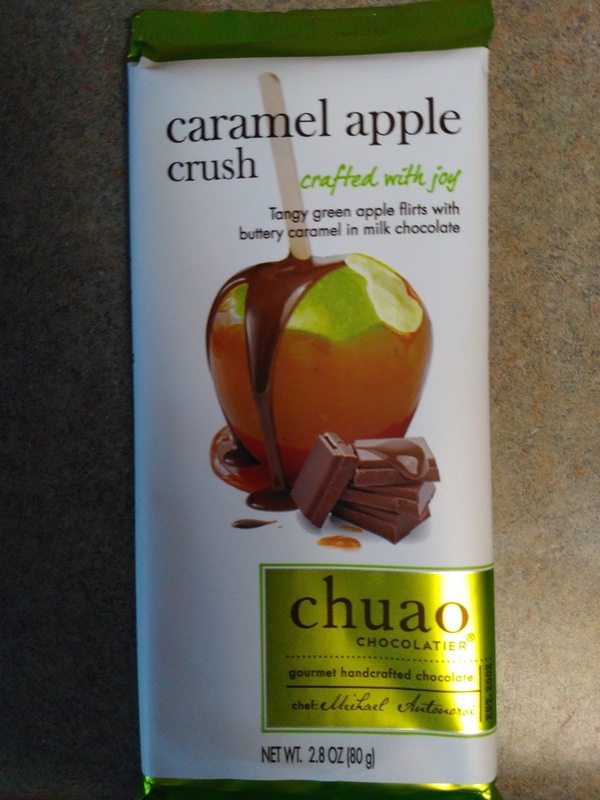 You won't find the same old, same old flavors from this chocolate company!! You can purchase Carmel Apple Crush, Firecracker, Baconluxious, Honeycomb, Potato Chip and Salted Chocolate Crunch bars now available in CVS stores nationwide. 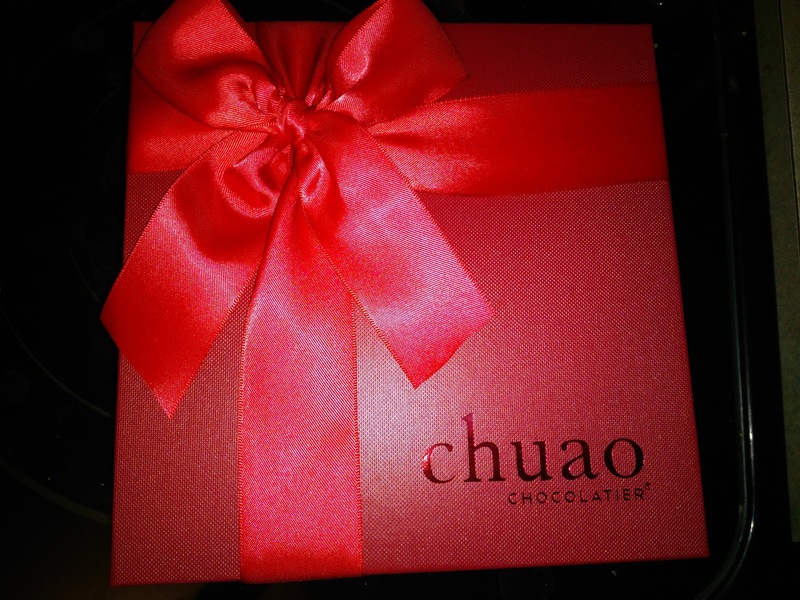 Chuao Chocolatier is generously offering (1) the Enamored Collection (set of three full-sized new bars) to TWO lucky winners! Harry Potter and the Cursed Child??? Young and old readers everywhere have waited with bated dragon’s breath for the release of this latest Harry Potter installment! FINALLY, Harry Potter and the Cursed Child was released at midnight on July 31st. The magical story picks up 19 years after the last book and introduces us to Harry Potter, who’s now a dad! He has three children with his wife, Ginny Weasley, James Sirius, Albus Severus and Lily Luna Potter. His youngest son, Albus, is following in his father’s footsteps and is a first-year student at Hogwarts. If you are potty training your toddler like I am, then I bet you have wised for some magic...I know I have! I am really struggling getting my 3rd child potty trained! But with this Potty Training Kit you can "magically" transform your tot into a prince/princess of the Potty Kingdom. 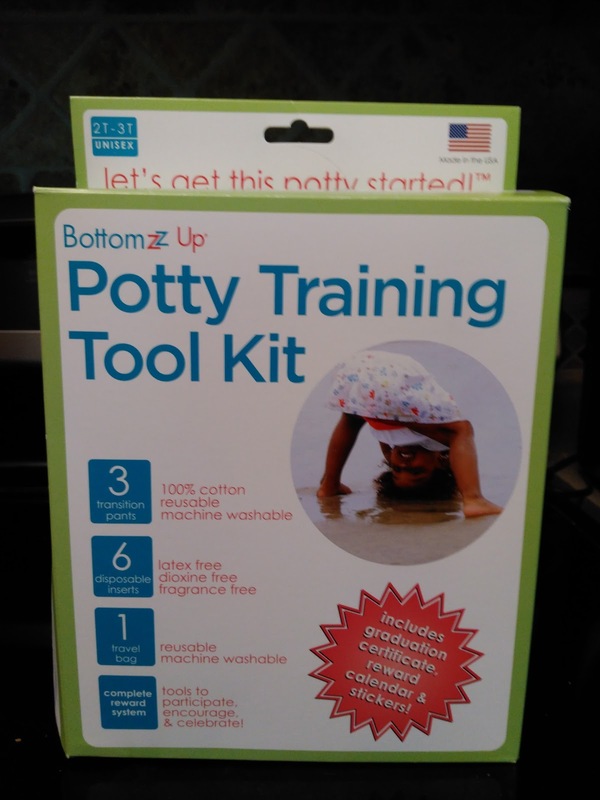 This is the only potty training system that allows toddlers to feel the discomfort of their accidents! The 100% cotton potty training underwear features proprietary technology that lets kids feel wet when they are wet, while wondrously trapping the pee to prevent leaks and messy clean ups. I really love this kit and how helpful it is for potty training my son! I love that he can feel wet without me having to clean up a big mess with every accident! I also love that the kit includes stickers and a reward chart which is what I was trying to do before but now I can be more organized! And it perfect for families on-the-go and this summer we are definitely constantly on the go! BottomZz Up offers the consistency, routine and encouragement kids need, day and night, home or out on the town. MSRP: $97.45. Available online at www.BottomZzUp.com. And we are creating magic in the house with the older children with HABA’s Flashlight Image Projector: Magic Lantern! Kid will love taking this Magic Lantern on their next sleepover adventure. HABA’s Flashlight Image Projector: Magic Lantern has three modes of play: a nightlight, projector lamp and flashlight. Kids can magically change between six images by turning the projector dial. A booklet includes hidden pictures that are not visible until the Magic Lantern is waved. My children LOVE playing Hide 'n Seek around the house as a family so this Magic Lantern is so perfect for fun family nights and also using it at bedtime as a nightlight! MSRP: $19.99. Available online at www.HABAusa.com. Keep your little wizards safe from germs with Baby Care by e-cloth. With just water and a wave of the Chemical-free Cleaning Toy & Nursery Cloth, you can remove drool, grime, and hardened messes from all hard surfaces in baby’s nursery or the toy room. This reusable, must-have cleaning companion removes over 99% of bacteria from toys and nursery surfaces with absolutely no chemicals used. Plus, it’s guaranteed to last for 300 machine washes. MSRP: $7.99. Available online at www.ecloth.com. Cast a sleeping spell on your infant with Miracle Blanket®, a safe and secure alternative to traditional swaddling. The Miracle Blanket® helps babies sleep better on their backs through 14 weeks, allowing freedom of movement from the hips down. With better, longer sleep, your little prince/princess will be less fussy, giving everyone (including you) the sleep they so desperately need. The fabric is a super soft 100% cotton knit that’s breathable so that it can be used in warm climates while still being luxurious enough to keep your baby warm in cooler places. For Birth-14 weeks. MSRP: $29.99. Available online at www.miracleware.com. Wizarding students everywhere can magically create train tracks for the Hogwarts Express anywhere in their home with the Classic Rail Series Railroad PlayTape from InRoad Toys. PlayTape revolutionizes the world of imaginative play! Available in different colors, styles and sizes… even curves! When play is over, PlayTape disappears right before your eyes in a flash with no messy residue! For ages 3+ years. MSRP: $8.99 and Up. Available online at www.InRoadToys.com. Celebrate #NationalWatermelonDay with Fun Facts & @Applebees Wood Fired Grill Salads! A gift card was given for review for my honest opinion. No other compensation was given. Did you know it is National Watermelon Day tomorrow??? August 3rd marks a day to celebrate Watermelon and its refreshing juiciness, spit seeds as far as you can and get a juicy watermelon mustache! To celebrate National Watermelon Day, I have some fun facts about Watermelon and also some tasty food suggestions to help you celebrate this fruity day! Check out these fun facts about Watermelon and use it to look really smart as you eat your Watermelon with others! Watermelon Is a Fruit AND a Vegetable! 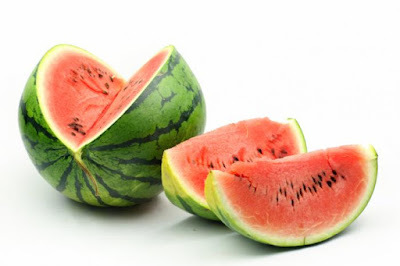 All parts of a watermelon can be eaten, even the rind, which actually contains a number of nutrients too. The watermelon is the official state vegetable of Oklahoma. Wild watermelons originated in southern Africa. There are more than 1200 varieties of watermelon that come in various weights, shapes, sizes and red, orange, yellow or white in color. And if you are looking to try some new ways to eat Watermelon on National Watermelon Day, head to your local Applebee's and try their new wood fired grill salads incorporating seasonal summer staples like Grilled Watermelon, Spicy Shrimp and Blackened Chicken! Applebee’s Neighborhood Grill & Bar® is giving the salad a smoky twist with the launch of NEW Wood Fired Grill salads, available now and starting at $8.99 at participating restaurants. Prepared on the new American-made wood fired grills, Applebee’s is now serving new made-to-order salads that pair tender shrimp, precisely-grilled chicken and Hand-Cut USDA Choice Top Sirloin with seasonal summer ingredients and made-in-house dressings for a unique salad experience. Taking center stage in Applebee’s arsenal of new offerings in anticipation of National Watermelon Day on August 3 is the NEW Grilled Watermelon and Spicy Shrimp Salad, a fresh combination of grill-seared watermelon prepared with a house-made mint-Greek yogurt dressing. · NEW Southwestern Steak Salad: Hand-Cut Wood Fired USDA Choice Top Sirloin Steak paired with chimichurri, pico de gallo, corn and black bean salsa, cheddar, crispy tortilla strips and a creamy house-made cilantro ranch dressing. 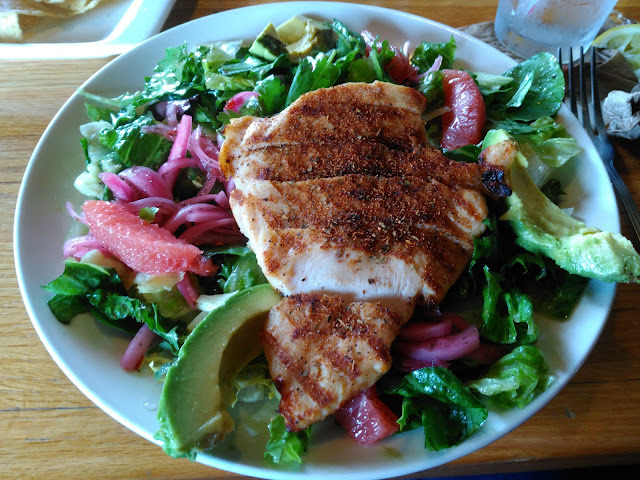 · NEW Spicy Blackened Grilled Chicken, Avocado and Grapefruit Salad: Mixed greens, pickled in-house red onions, cilantro leaves and house-made champagne vinaigrette. · NEW Crispy Chicken ‘N Spicy Cornbread Salad: Mixed greens, made-in-house jalapeno cornbread croutons, grape tomatoes, shredded cheddar, applewood-smoked bacon and buttermilk dressing. 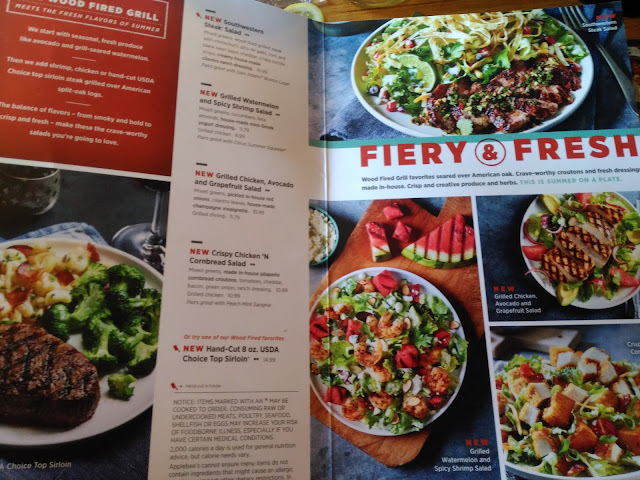 I recently got a date night with my hubby and we headed off to Applebee's to try these delicious looking Wood Fired Grill salads! It was a super hard choice but I chose the Spicy Blackened Grilled Chicken, Avocado and Grapefruit Salad because I really like Avocado! And I was really happy with my choice! It was really refreshing with the fruity Grapefruit, perfectly cooked moist chicken and the avocado to compliment it all! I love the mix of flavors and ingredients - I definitely recommend! I can't wait to try the NEW Grilled Watermelon and Spicy Chicken Salad next time! It look so good too! Win a $100 Applebee's Gift Card! Also, from July 20 – August 3 YOU can enter for a chance to win a $100 gift card to Applebee’s by submitting YOUR favorite salad recipe via Applebee’s Twitter or Instagram using the #WoodFired hashtag or their best #WatermelonSmile (using the fruit to make a smiley face). Have fun celebrating National Watermelon Day and don't forget to try out your new found fun facts about Watermelon and try the new Wood Fired Grill Salads from Applebee's! 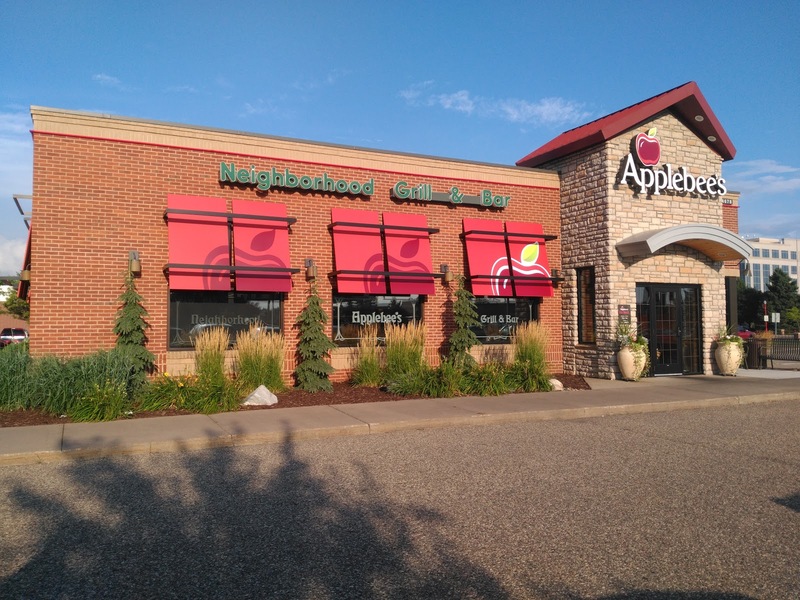 You can find your local Applebee's here! Confirmation on DVD with Digital HD & Blu-ray TODAY! Nominated for two 2016 Emmy Awards® including Outstanding Television Movie and Outstanding Lead Actress in a Limited Series or Movie (Kerry Washington), the HBO Film will be arriving on Blu-ray and DVD August 2nd. It only takes one voice to change history. 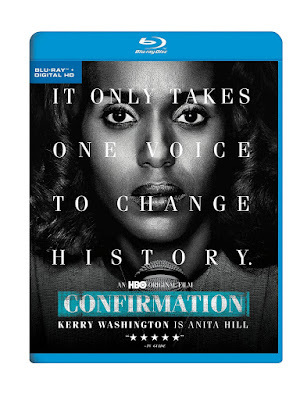 HBO Home Entertainment proudly presents the June 27th Digital HD and August 2nd DVD with Digital HD and Blu-ray with Digital HD release of the critically acclaimed Confirmation. The film details the explosive Clarence Thomas Supreme Court nomination hearings, which brought the country to a standstill and forever changed the way we think about sexual harassment, victims’ rights and modern-day race relations. It looks behind the curtain of Washington politics, depicting a pivotal moment in American culture that became a turning point in workplace equality and gender politics. The HBO Film was nominated for two 2016 Emmy Awards® including Outstanding Television Movie and Outstanding Lead Actress in a Limited Series or Movie (Kerry Washington). In July 1991, President George H.W. Bush nominated Judge Clarence Thomas to fill Justice Thurgood Marshall’s seat on the U.S. Supreme Court. In October, during the final days of Thomas’ confirmation hearings before the Senate Judiciary Committee, both Newsday and NPR broke the story that one of Thomas’ former employees, law professor Anita Hill, had accused him of sexually harassing her ten years earlier. These revelations triggered a maelstrom of events, with both Hill and Thomas testifying about the allegations before a stunned and riveted television audience. 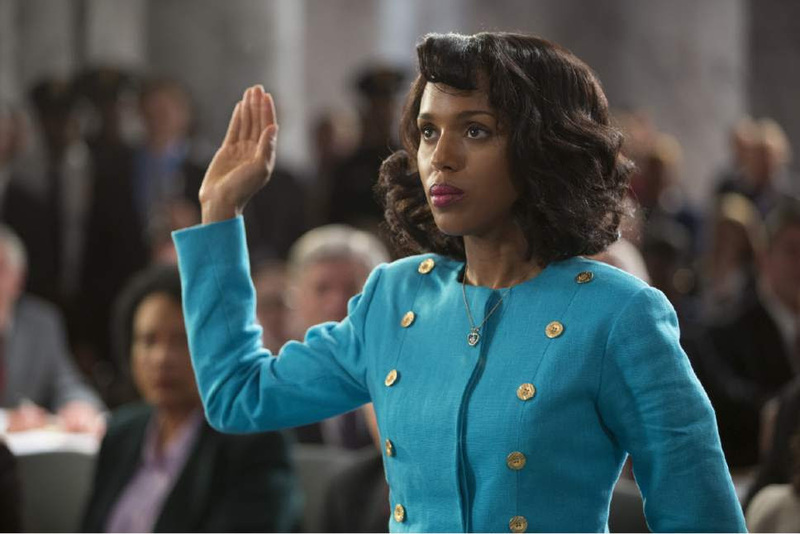 The release includes brief discussions with Washington and Pierce on the historical impact of the hearings as well as “Character Spot” featuring cast members discussing the character they play. Confirmation features “powerful” (Variety), “affecting and nuanced performances” (Los Angeles Times) from an all-star cast lead by Washington (Emmy® and Golden Globe nominee for Scandal), Wendell Pierce (HBO’s Treme and The Wire), Greg Kinnear (Oscar® and Golden Globe nominee for As Good as It Gets), Jeffrey Wright (Emmy® and Golden Globe winner for HBO’s Angels in America), Eric Stonestreet (Emmy® winner for Modern Family) and Jennifer Hudson (Oscar® winner for Dreamgirls). The film was written by Susannah Grant (Oscar® nominee for Erin Brockovich) and directed by Rick Famuyiwa (Dope). Travel the World While Eating Delicious @noodlescompany Salads! On a hot summer day, there is nothing more refreshing than a fresh, tasty salad! Especially as I am trying to get back on my weight loss track after a busy summer full of eating stuff I probably should't have! So when I don't want to cook but I don't want to sacrifice my good nutrition, I head to one of my favorite restaurants - Noodles & Company and grab one of their NEW delicious and fresh salads! Noodles & Company recently launched three summer salads that I am LOVING– the new Napa Market Salad with Chicken, Chicken Veracruz Salad and the guest-favorite Med Salad with Chicken – as part of their new “World Tour” menu. In addition to using authentic ingredients such as Gala apple slices, fresh, hand-cut corn and avocado, the salads also feature bacon never given antibiotics or hormones, which further demonstrates the brand’s continued commitment to real food, real cooking and real flavors as part of their Made. Different. positioning – they never use any artificial colors, flavors, sweeteners or preservatives in any of their dishes and that means so much to me!! And what I love even more is I get to go on a culinary journey through Mexico, California and Greece with these three bold and flavorful salads! I got the chance to try some of these delicious salads and I really was impressed! The mix of ingredients and dressings were interesting, unique and best of all - DELICIOUS!! I first started out by trying the *NEW* Napa Market Salad with Chicken! Fresh and flavorful market ingredients embody the Napa Market Salad with Chicken. 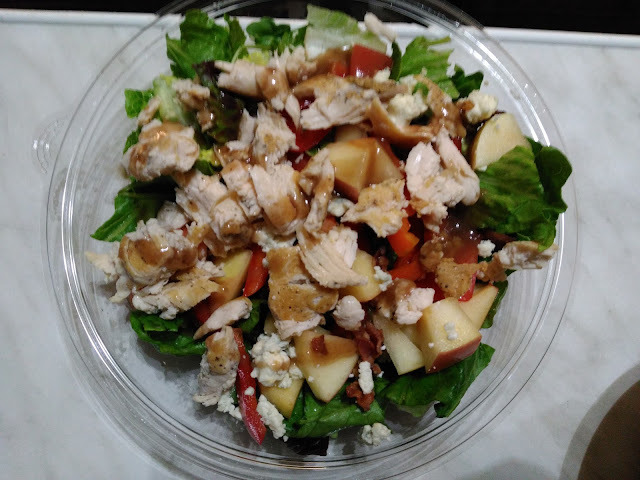 Mixed greens are layered with Gala apple slices, Roma tomato, red bell pepper and pulled grilled chicken. Tossed with pomegranate vinaigrette and topped with bleu cheese crumbles and naturally raised bacon, this salad offers a sweet and savory explosion of flavor. This salad had all the food groups! 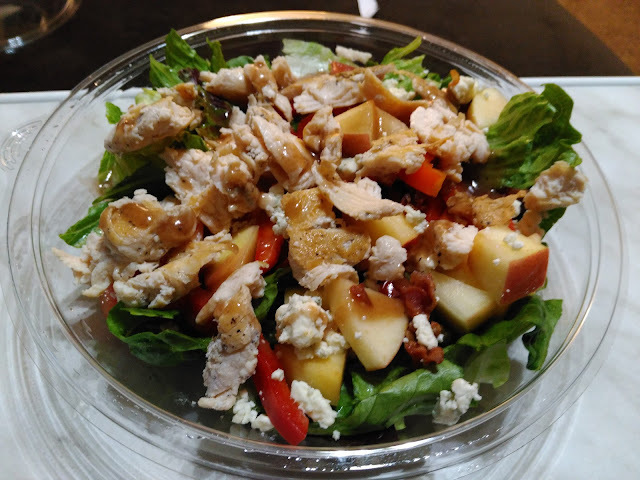 :) I loved the sweet apples paired with the salty bacon topped off with the flavorful vinaigrette. It was a great mix of ingredients and I would definitely get this salad again! The next time I went to Noodles & Co., I tried the The Med Salad with Chicken. I also really enjoyed this salad! Guests are invited to explore the richness and splendor of Greece with Noodles & Company’s The Med Salad with Chicken. Mixed greens and romaine are first layered with tomato, cucumber, red onion and Kalamata olives. The salad is then tossed with spicy yogurt dressing and topped with cavatappi pasta and feta cheese for a fresh, flavorful bite. This salad had a little twist on it with noodles added in! 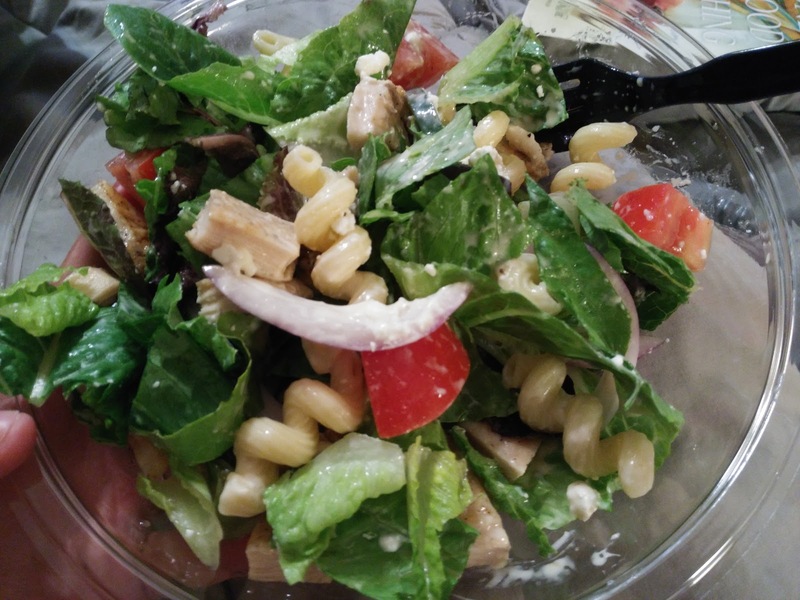 I loved that I got a little pasta with my salad and the yogurt dressing was really delicious! This salad is also a great mix of flavors and I would definitely get this one again as well! 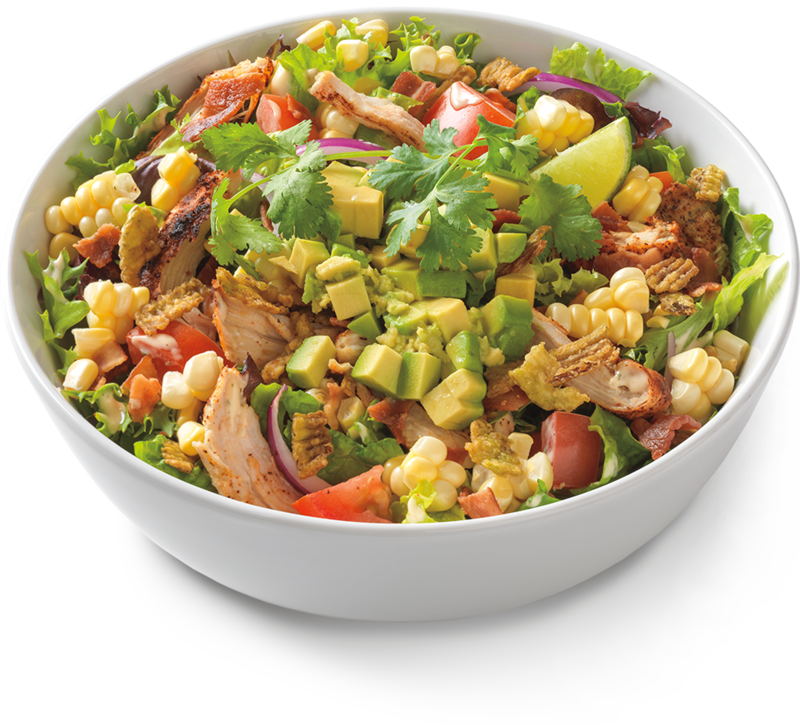 And if you like a little kick to your food, then you may LOVE the *NEW* Chicken Veracruz Salad. A foray into Latin flavors, the Chicken Veracruz Salad starts with a bed of mixed greens and is layered with Roma tomato, red onion, chili-lime chicken, crumbled, naturally raised bacon and fresh, hand-cut corn. This salad is then tossed with Jalapeno Ranch dressing and topped with crispy jalapenos, avocado and cilantro with a wedge of lime, for a spicy, citrus kick. So if you are looking to shut off the oven and take a break from cooking this summer without sacrificing your diet and health head to your local Noodles & Co. and taste flavors from around the world with their new salads! The flavors are great and they are so refreshing!